Co-produced by the band and Chris Coady, the album was released less than two months after Depression Cherry to widespread acclaim. Over the last decade, Beach House have been remarkably consistent: at regular intervals, they put an immaculate new record into the world, and each tends to satisfy the same need. Until now, their pace of releases has indicated a grasp of the spot their music held in listeners’ hearts; the world that Alex Scally and Victoria Legrand build on their records is a place we want to revisit, but the spaces in between records has felt essential to that magic. They are in their own way a theatrical band, and what’s more theatrical than a well-placed pause? 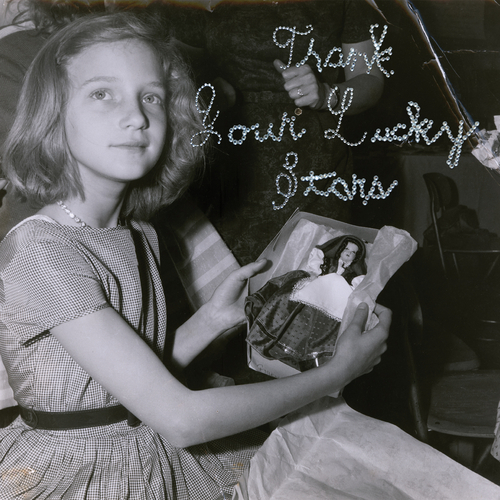 Which all makes the appearance of Thank Your Lucky Stars, the band’s second full-length in as many months, surprising. Depression Cherry is still very much in view, and as fans, it feels a bit like the cast to a hit show suddenly reappearing for one more encore after the house lights have switched on and we were filing out. Thank Your’s nine songs were recorded at the same time as Depression Cherry, and they do have a slightly darker edge: Legrand said that the album was more "political" in nature and that they felt the need for these songs to exist on their own, separate from the long-lens telegraphing of the typical album release cycle. Their sound feels purposefully smaller, tamping down the reverb that made Teen Dream, Bloom, and Depression Cherry feel like they were recorded in great stone cathedrals. You can hear them experimenting more with "off" notes in their otherwise-immaculate arrangements. On "Somewhere Tonight", Legrand lets a sour note sneak into one of her organ runs, and "One Thing" opens with a heavy cloud of electric guitar that feels more tethered to snaking cables and rattling amps than usual. Spiritually, the album feels closer to the mood the duo cultivated before they signed to Sub Pop: These songs feel pneumatic, dusty, like they are pulling a blanket around themselves in a heatless attic to ward off a threatening chill. The mood is also bleaker in spots, as if joy and comfort had vanished from the songs along with the reverb. "All Your Yeahs" is closer to the midnight sulk of Johnny Jewel and Chromatics than their usual open-air romanticism. And "Elegy to the Void", the album’s clear standout, might be the most death-obsessed Beach House have ever been: The organ processional that wells up in the song’s intro has a funereal tinge, while Legrand sings darkly of "Sons and daughters/ Bending at the altar/ Disappearing in the mirror." The song offers a series of gorgeous images—a "black clock, looming distant" and "freckle-faced young virgin"—as it surges into a slow-motion burst, Scally’s normally crystalline guitar breaking apart like a DNA strand uncoupling. But Thank Your is still undeniably a Beach House album, a familiar mix of warm tones and chilly sentiments. With the imprint still fading on Depression, Thank Your’s impact is undeniably dulled, causing a strange "too much of a good thing" problem. You start noticing surface similarities that you wouldn’t pay attention to otherwise: Play the arpeggiated keyboard figure that opens this album’s "Common Girl" next to Bloom’s "On the Sea", for instance. Their music is built on echoes: even their self-titled debut felt like covers of chansons you didn’t remember. Timing isn’t everything, of course, and Thank Your Lucky Stars, as surprising a gesture of generosity as it is, is still welcome. But Legrand and Scally, who know their way around a stage, would do well to gracefully exit left for a while and give this run of music some time to sink in.